Doodle Dice uses six dice to create pictures. Each playing card has a picture on it that can be make using the designs on each of the six dice. When you build a doodle that matches one of the cards, you get to take that card. There are six different colors of cards. Your goal is to get a card from each color category. Block cards and Free Roll cards add an interesting twist to a fast paced game for the whole family. Doodle dice is a great game the entire family can play. Be the first player to collect a set of six cards - one of each color: one green, one red, one blue, one orange, one purple and one yellow. 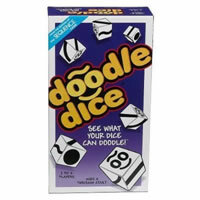 Doodle Dice game includes 6 dice, 65 playing cards, shaker cup, and Doodle Dice game rules and instructions. Please keep in mind that the official Doodle Dice childrens rules and instructions could be different depending on the game version you have. The rules below are some of the exact directions on how to play Doodle Dice. Share with us your comments, funny stories, tips, advice, strategies, creative ways to play, questions about how to play, problems with the rules or anything you want about Doodle Dice. All submissions will be reviewed within 24 hours. Click here to add your Doodle Dice comments. My kids (ages 5 and 8) really like this game. I like it, too. I think it's a nice family game. Kind of like Yahtzee but with symbols. My kids love this game and can easily take it anywhere we go whether it's on vacation or just to grandma and grandpa's house. Learning how to play is easy from the simplified rules and they caught on fast. I guess it is just the fun of rolling the dice that gets my kids going.